Music director Ghulam Mohammed ('Mirza Ghalib','Paakizah') was another composer who gave a noteworthy contribution to film music as a composer and a rhythmist. He suffered a severe set-back when 'Paakizah' was held up for eight years as a result of a personal dispute between 'Meena Kumari and her producer husband Kamal Amrohi. During this difficult time Ghulam Mohammed lived mainly on hopes. Proud that he was, he never discussed his personal problems, but once out of sheer desperation he talked about it to this writer while referring to the high hopes he was nursing about his prospects after the completion of the magnum opus 'Paakizah'. Once Sahir Ludhiyanvi wrote "Yeh Basti Hai Murdaparaston Ki Basti". Throughout life man live with the hope of getting his desires fulfilled, but till the end he achieves nothing and it is after his death only that people realize his worth. Music director Ghulam Mohammad also faced the same destiny. Throughout his life he served music, but in return of nothing. He became a victim of the dirty politics of Hindi cinema. Till today the songs of Paakeejah sound like a fresh breeze of air to music lovers. Songs like 'Chalo Dildaar Chalo..', 'Inhi Logon Ne Le Leena..' and 'Chalte Chalte..' have been listeners' all time favourites. Mohammad's music in Paakeejah achieved a record breaking success. Ghulam Mohammad inherited music from his forefathers. His father Nabi Baksh was a Tabla maestro. Both father and son together gave countless performances in Albert Theatre. No sooner Mohammad got a job in Albert Theatre than the financial condition of the theatre deteriorated, and he lost his job. Next he got himself in a company's orchestra group. At last, in 1924, Ghulam Mohammad came to Bombay. After a long struggle of eight years, in 1932 he finally got the chance of playing table in Saroj Movietone's Productions' "Raja Bharthari". His performance was highly appreciated and he became a popular name. He worked with great music directors like Anil Biswaas and Naushad. From 'Sanjog' to 'Aan' he worked as an assistant to Naushad. His tabla and dholak became the speciality of Naushad's music. After 'Aan', Ghulam started working independently. With films like 'Paaras', 'Mera Khwaab', 'Tiger Queen' and 'Doli' Ghulam Mohammad won a place for himself in cine world. 'Pagdi', 'Pardes', 'Naazneen', 'Gauher', 'Rail Ka Dibba', Hoor-e-Arab', ' Sitara' and 'Dil-e-Naadan' are some other movies to be added to his account. If we cast a cursory glance at his compositions we'll find repetations in his tunes, but on listening seriously we do come across their special features. Songs like 'Jahan Wale Hamen Duniya Me Kyun Paida Kiya..' from the film Kundan and 'Dil Gham Se Jal Raha Hai Par Dhuan Na Ho..' from Shama are apt enough to acknowledge his excellence. Ghulam Mohammad took the initiative of setting the trend of playing the "Matka" as an instrument in film music. The two most popular compositions where he used the "Matka" are 'Is Dard Ki Mari Duniya Me Mujhsa Bhi Koi Majboor Na Ho..' from Paras and 'Ye Duniya Hai Yahan Dil Ka Lagana..' from Shayar. Mohammad got the President's award for his film "Mirza Ghalib". 'Phir Mujhe Deeda-e-Tar Yaad Aaya..', 'Ishq Mujhko Nahi Vehshat Hi Sahi..' and 'Dil-e-Naadan Tujhe Hua Kya Hai..' were the most popular ghazals of Mirza Ghalib.. 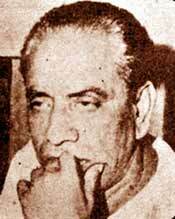 Composing situation friendly music was also one of the Ghulam's speciality. Songs like 'Chal Diya Caarvaan..' and 'Aasmaan Wale teri Duniya Se Jee Ghabra Gaya..' from the film Laila Majnu can be casted as an example. But at any rate, even today, compositions like 'Inhi Logon Ne..' and 'Chalo Dildar Chalo..' linger the memory of Ghulam Mohammad. The only regrettable fact is that Ghulam Mohammad's talent was acknowledged only after his death.